Carson Herrington seemed destined to organize art exhibitions at Bennett Park Art Atrium 1 this spring. Although she's lived in Arlington for years, the independent curator was unfamiliar with the space in Upper Rosslyn until she encountered it one day by chance while walking her dog. She got in touch with the company that manages the Atrium to find out more about it. Soon, she had agreed to pull together several spring exhibitions of local artists there, including new monthly Art in the Atrium shows from March to June and the Friday-night Rosslyn CAFÉ series hosted by the Rosslyn BID. The Rosslyn BID launched Rosslyn CAFÉ at Bennett Park in 2017. 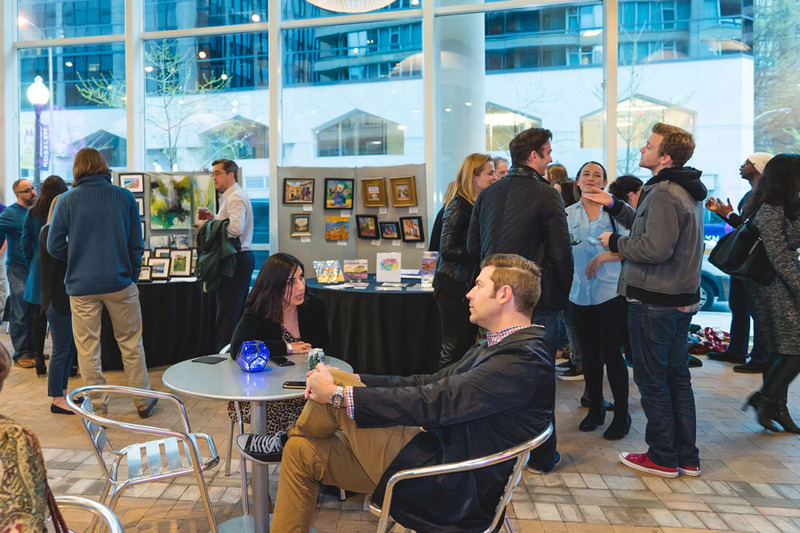 Besides introducing people to the Atrium, the events brought a diverse coterie of neighborhood residents and employees together to enjoy music, food and drinks while perusing works by local artists. The series was so successful that the BID decided to bring it back this year. But this time, finding artists able to exhibit during the four Fridays the event is planned proved surprisingly difficult. Herrington's interest in Bennett Park couldn't have come at a better time. 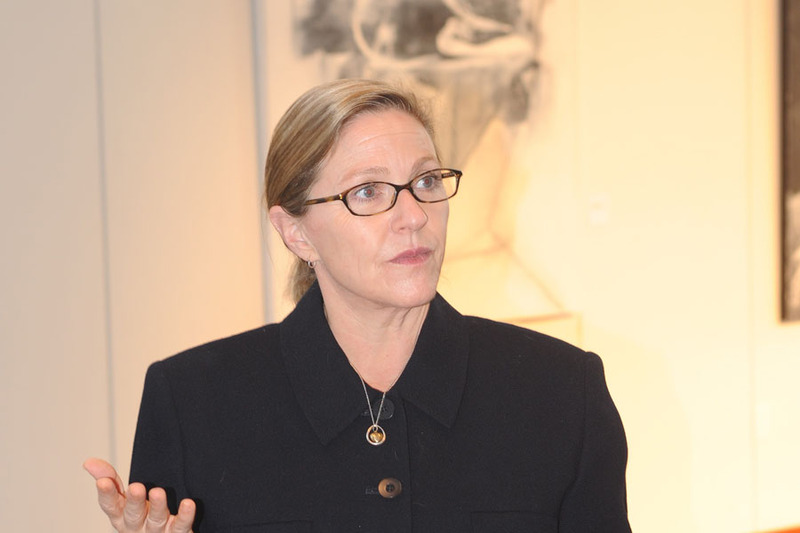 No stranger to the art world, Herrington has two master's degrees in related fields and has worked in art museums around the country for 20 years, including several years at the Smithsonian's Freer and Sackler galleries in Washington, D.C. Since 2015, she's been an independent curator putting on exhibitions at a variety of spaces, including the Center Gallery at the Unitarian Universalist Church of Arlington (UUCA). Her company is called Out of Bounds: Custom Exhibitions — Uncustomary Spaces. Herrington handpicked most of the artists exhibiting at Bennett Park Art Atrium. Some will be featured at Rosslyn CAFÉ Friday night and then exhibited all day on Saturday at Art in the Atrium. The first Rosslyn CAFÉ is this Friday, March 22, and will feature the work of Peter VanderPoel and Anne Browne. Besides browsing their art works, visitors can enjoy a cash bar and free food. If you don't make it to Rosslyn CAFÉ, you'll have a second chance to see their work at Art in the Atrium that Saturday, March 23, from 11 a.m.-7 p.m. Herrington knows many of these artists very well and is excited to share their work with the neighborhood. Lukman Ahmad, who will be on view at Rosslyn CAFÉ April 12 and at Art in the Atrium April 13, was the first artist Herrington exhibited as curator at the UUCA's Center Gallery. He came to the United States in 2004 as a refugee from Syria. His work, pictured at the top of this page, reflects the human experience and the Kurdish experience, telling the story of a people without a nation but still with a rich and full culture. His canvases are bright, bold and colorful. "He's an amazing artist and a talented musician, too," Herrington says. "He works for Voice of America radio and is a fascinating person with a charming personality." Two other noteworthy artists, Morgan Johnson Norwood and Fernando Osorio Zumarán, will exhibit together at Art in the Atrium on May 11. Herrington put them together because she thought their works resonated with each other. Johnson Norwood creates paintings, sculptures and works on paper, many of which reflect her fascination with nature, including seed pods, fire and flames, forests and trees. Raised in Atlanta, Johnson Norwood has lived in the Washington, D.C., area for over a decade and teaches art at Campbell Elementary School in Arlington. Osorio Zumarán was born in Peru but has lived in the United States since 1988 and now resides in Springfield. "Fernando experiments with many different styles," Herrington says. "His range is vast and he's very prolific." Osorio Zumarán's work is influenced by modernist masters, including Wassily Kandinsky and Paul Klee. And then there's Wayson R. Jones, whose work will be shown at Art in the Atrium on June 8. Jones is a D.C. native and an Army brat, Herrington says, and has engaged in wide-ranging activities over the years: music, dance, spoken-word/performance and painting. His paintings are informed by these experiences, the legacy of Abstract Expressionism and an exuberant approach to materials and process. He has a studio in the Brightwood neighborhood of D.C. "Most of his works today are monochromatic, but he also made a series of colorful pastels," she says. Other artists exhibiting at Bennett Park Art Atrium this spring include photographers Birch (March 29) and Dagmara Weinberg (April 5) and painters Peter VanderPoel and Anne Browne (March 22 and 23) and Richard Levine. At both Art in the Atrium and Rosslyn CAFÉ, patrons will have the opportunity to meet the artists and purchase their works. It's a great place to support local talent while gaining quality pieces for your home. For those who are new to acquiring art, Herrington says the number one rule when making a purchase is simply that you have to like it. "It should sing to you," she says. "But sometimes, it takes more than one look before you really fall in love with a piece of art, kind of like music. Many people like to buy work from someplace they have a connection to . . . a place where they've lived or a time or place that has a story connecting them to it in some way." Others like to collect art as an investment. For those who are thinking about building a collection, Herrington says you may want to acquire more than one piece by a certain artist, and figure out the scope of what that person does. Alternatively, you could buy several pieces of art from a particular genre, like color field paintings, or prints or photography. Works on paper are always more affordable, but they are also more vulnerable to light, so they need to be framed, protected and cared for in a different way than oil on canvas, which is pretty hardy and requires only occasional dusting to be maintained. Herrington says the works she'll be exhibiting at Bennett Park Art Atrium will all cost from $200-$800, with the majority in the $400-$600 range. Out of Bounds and the artists will donate 10 percent of proceeds from all sales to local nonprofits. "Giving back is very important to me," Herrington says. "I've identified some local nonprofits I'd like to support, but the artists have to agree since it's their work that ultimately generates the money. I'll run those by the artists to be sure they're okay with that." Thus far, Herrington has selected Arlington Thrive (March 23), Dream Project (April 13), Everybody Wins (May 11) and Beacon House after-school enrichment (June 8). To learn more about Out of Bounds, visit their website. To learn about art events going on in Rosslyn this spring, check out our event calendar. The Friday night Rosslyn CAFÉ series returns to Bennett Park Art Atrium March 22. It's one of two art-focused event series this spring that offer patrons the opportunity to purchase art by local artists. Out of Bounds exhibitions, led by Independent Curator Carson Herrington, will donate 10 percent of proceeds from art sales to local charities. 1. The Bennett Park Art Atrium is a public art gallery and outdoor courtyard on the ground floor of the Bennett Park Apartments. The Atrium was established as a community benefit when the tower was built. It houses a few art works year-round and is free and open to the public. In 2017, the Rosslyn BID hosted the first Rosslyn CAFÉ Friday-night event series here.